A collection begging for Doug Glassman to review, this apparently collects the DC Comics/Dark Horse crossovers Batman/Aliens, Batman/Aliens 2 (supposedly just the first two issues of each, but I'm sure it's both), and WildCATS/Aliens. There's no Vol. 1 listing here to suggest a Vol. 2, though there's two Superman/Aliens stories that could still be collected plus Green Lantern/Aliens, and Superman and Batman vs. Aliens and Predator, though most of not all of this has been collected before. Notable here is the WildCATS story, which bridged Stormwatch and Authority, which was excluded from the recent Stormwatch hardcover but was collected in previous Stormwatch volumes. Said to collect Batman: Holy Terror (the first Elseworld labeled as such, an alternate history in which America remains under British rule), Batman: Dark Allegiances (Batman before World War II, by Howard Chaykin), Batman: Dark Joker – The Wild (fantasy setting by Doug Moench and Kelley Jones), Batman: In Darkest Knight (Batman/Green Lantern mash-up by Mike Barr) and Robin 3000. And more? For a very long time I didn't think these Superman stories would ever be collected; just my supposition, but one good thing to come out of the Man of Steel movie is I think it freed DC to bring these out. 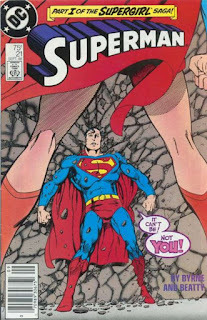 This is Superman #19-22 and Adventures of Superman #441-444, the "Supergirl Saga," in which Superman meets Supergirl (later Matrix) on a parallel earth and has a significant run-in with General Zod, leading eventually to the "Exile" storyline. This collection also has appearances by the Doom Patrol, Mr. Mxyzptlk, and Psi-Phon and Dreadnaught, an annual with the Guardian and the Newsboy Legion, and a short story that, progressive for its time, addresses Maggie Sawyer's sexuality. This collects the end of John Byrne's run on Superman, so inasmuch as this collection might have been in doubt, it'll be interesting to see if there's another. This would be a "good" stopping place for this series (but I hope they won't); if it continues, sky's the limit as to how far into the post-Crisis Superman era this could collect. 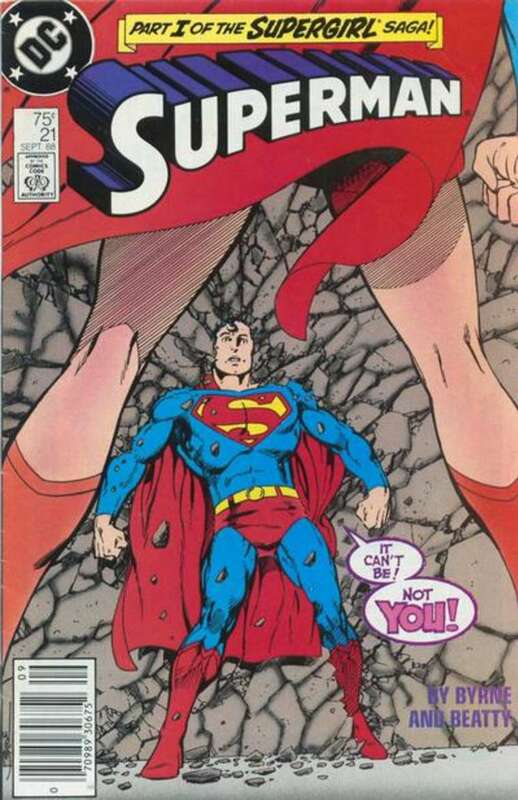 I had wondered why DC was reprinting this, a good story but significantly of its time; however, the solicitation line "The story that forever altered the relationship between Superman and Wonder Woman" might be the hook, between their current DCU relationship and also the Dawn of Justice movie. Contents appear the same as the original printing. Not that I'm not excited about this latest John Ostrander Suicide Squad collection -- issues #17-25 and the first annual -- but I'm equally excited to see this collection series succeed so that we get the rumored Suicide Squad Vol. 4 collection that includes the "Janus Directive" crossover with Checkmate, Manhunter, Captain Atom, and Firestorm. Included in this volume is an Invasion! tie-in issue. What had been Nightwing Vol. 3: Love and Bullets in the original collections is now Vol. 4 (with the addition of the miniseries and such back at the beginning), and the contents here span the original Vol. 3-Vol. 4. We also get the DC One Million issue, the first time it's been collected outside the big omnibus. This new collection of Gail Simone's original Secret Six series spans Vol. 3, Reptile Brain, and Vol. 4, Darkest House, with the Action Comics and Blackest Night tie-in Doom Patrol issues, finishing out the series. As part of renewed relations between Tony Isabella and DC Comics, this is all the issues of the original 1970s Black Lightning series, plus the Cancelled Comic Cavalcade issue. Collects the two previous collections Flash: Emergency Stop and Flash: The Human Race, but it includes this time the other parts of the "Three of a Kind" crossover with the Green Lantern and Green Arrow series of that time. Not mentioned is Grant Morrison's Secret Origins story that was previously in Human Race. Collects the final issues and first annual of the Ray Fawkes series, as well as the preview story from Convergence: Catwoman. The six-issue miniseries by Cullen Bunn and Jesus Saiz, precursor to Green Lantern Corps: Edge of Oblivion. Equally hard to place why there's a "new edition" (as opposed to just a reprint) of the DC mega-crossover Invasion! by Keith Giffen (with some art by Todd McFarlane), but neither am I complaining that it's still in print. The book does include appearances by the currently-popular Omega Men, come to think of it. This is said to only include Cullen Bunn's Lobo #7-9, the annual, and the preview story from Convergence: Green Lantern/Parallax, though that seems like not a lot of issues. These issues are related to Sinestro, but maybe not specifically a crossover, so it's hard to say if maybe some of those will be slotted in here. Collects issues #41-47 of the Meredith Finch series. As 2015 comes to a close ... what's on your to-buy list for this month? Your holiday wish list? Safe and happy and all best! Elseworlds: Batman should also have Batman: The Blue, the Grey, and the Bat, because Elliot S. Maggin is listed among writers. In general I think they're collecting them in order they were released, so one could guess the rest based on the page count. I had the Green Lantern vs. Aliens trade ages ago and thought it was really good, so I'd be willing to check out the larger world of DC vs. Aliens. *As I've done before, I've split the solicits into classic and modern due to the large amount of listings. *Marvel Masterworks: Ms. Marvel Vol. 2 HC—To my surprise, this collects “Avengers” #200 along with “Avengers Annual” #10, disproving the notion that Marvel won’t reprint one of the most controversial Avengers stories ever. This also marks Mystique’s first appearance. This is one of those runs that may not get a softcover collection; at the very least I wouldn’t expect one to drop before the Captain Marvel movie comes out. *Captain America Epic Collection: Man Without a Country TP—The first part of Mark Waid’s classic Cap run is collected here along with a few tie-in issues so you can see the kind of material it had to compete against. *Iron Man Epic Collection: Duel of Iron TP—With the ECs continuing at this rate, collecting the drunken Tony and crazy Rhodey era right before the rise of the Iron Monger, maybe they’re going chronologically before they get to the Modular Armor. At this rate they could get to it by the end of 2016. *Hawkeye and the Thunderbolts Vol. 1 TP—This trade finally picks up where the third volume of “Thunderbolts Classic” left off. Looks like I was wise to not pick up those issues on Comixology because I want to keep a display of TB trades. *Invincible Iron Man: Reboot—I still refuse to pay $25 for a five-issue hardcover, but there are several ANAD titles coming out in that format that I’ll mention for posterity. I’m particularly interested in “Invincible Iron Man: Reboot” (a collection name that has to be a tweak at fears of a total Marvel reset). *Avengers: Time Runs Out HC—The diehard wait-for-traders are the winners here. The four previous hardcovers were $25 each, but this big collection of the four is $50, so kudos to keeping the price down in at least one iteration. *All-New All-Different Marvel—Most of the ANAD runs being collected in softcover in March are books that I read monthly, in particular the various Avengers titles and “Captain America: Sam Wilson”. They’ve all been consistently good with some (CASW and New Avengers) being truly excellent. *Contest of Champions Vol. 1: Battleworld TP—I never thought I’d see the title “Contest of Champions” in the same sentence as “ongoing series”, but Al Ewing adds his usual flair to a continuing duel of multiversal armies. It may be the best video game tie-in comic yet produced. *Deadpool and Cable: Split Second TP—This is a digital-first comic that bridges the gaps in Cable’s recent history and reunites Fabian Nicieza and Reilly Brown. It also leads into Uncanny Avengers and answers questions that no one expected to ask just a few weeks ago. *Mrs. Deadpool and the Howling Commandos TP and Deadpool: Millionaire with a Mouth TP —A double dose of Duggan’s Deadpool. In the former, an alternate-universe Shiklah uses an army of monsters to prevent her marriage to Dracula, while in the latter, the Mercs for Money form up thanks to Deadpool’s promises to pay them. *This Damned Band TP—Paul Cornel wrote a deconstruction of heavy metal “devil worship”, and that’s a writer/concept combination that I can get behind. *Transformers: Armada Omnibus—There’s a missed opportunity here; this should collect the three-issue Armada guidebook that Dreamwave put out. Hopefully IDW has an arrangement to give most of the profits to Don Figureroa and the other artists who got swindled by Pat Lee. *String Divers TP—This is actually the Micronauts relaunch that came out before Hasbro reestablished the copyright to the name. It ties into Japanese Microman toys so I’m not sure if this will end up in canon with the Micronauts revival. *A&A: The Amazing Adventures of Archer and Armstrong #1—They’re back! Unfortunately, Fred Van Lente isn’t writing the return of Valiant’s greatest duo, but they look to be in good hands. *Imperium Vol. 3: The Vine Imperative TP—The second trade either just came out or will drop soon, which is good because I’m falling behind. "Collects the two previous collections Flash: Emergency Stop and Flash: The Human Race, but it includes this time the other parts of the "Three of a Kind" crossover with the Green Lantern and Green Arrow series of that time." Where are you seeing this? The amazon link just lists The Flash issues as being collected. It also only lists 130-138 and those 2 trades collect 130-141. Very confused. It's in DC March solicitations. Amazon listings (especially those added six months or so before release date) can only tell you that the book might be coming, not what's in it. I would absolutely love for them to continue the JLI collections!